Greetings Friends and fellow crafters, LeeAnn here with another project for the Coffee Oasis Blog Hop happening this week. I am so happy that one of my design teams is a sponsor for this hop, and so used some of the Kat Scrappiness Dies along with Paper, Ink and Stamps from White Rose Crafts to put this card together. 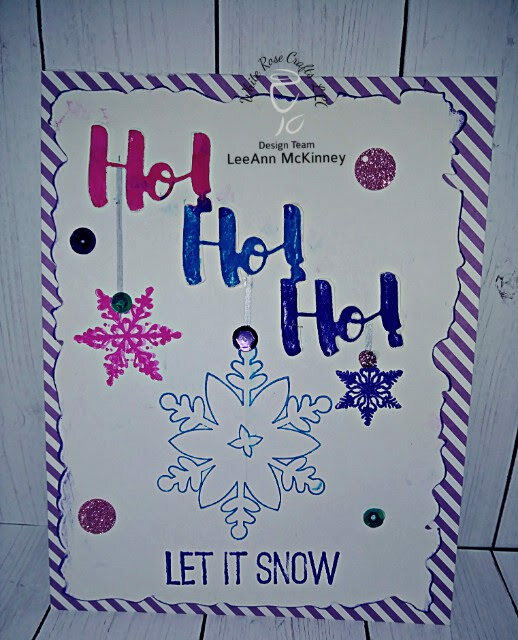 For the project I used Pink/Blue and Purple Scrapberry Stain's Ink to not only stamp the three snowflakes but also to color the Ho Ho Ho die cut. The background stripped paper is also from Scrapberry, and the sentiment and snowflakes are from Dovecrafts Magic & Sparkle stamp set (all of which are in the White Rose Crafts December Card Kit (for the ink it is only the purple). The Ho Ho Ho die and the Distressed Edge die are from Kat Scrappiness. My final touches on this card were some Sparkle Blends from Doodles Paper Playground "Very Merry". We are hoping that this blog hop will bring awareness to organizations such as Coffee Oasis and that we can raise a little money and support or them! Kat Scrappiness has pledged to donate 15% of all sales proceeds to Coffee Oasis and our other sponsors have all donated prizes to give away to all of you blog and youtube hoppers! So please visit them and show some support. You can also donate directly to Coffee Oasis here: http://kskat.com/donate. Even if you can only donate $1 or $5, it doesn't matter. Every little bit will help a kid in need. What a really cute card! What a festive card, so super adorable! Such a bright and cheery card! Such a sweet creation! I love the colors! Your card makes me smile with the big Ho ho ho!! Great card LeeAnn!! Very cute! Love that sentiment! I love the non-traditional color combo! You stamped my favorite colors. Love your card. that ho! ho! ho! die cut just sets the tone! Very cute in these fun colors! Very colorful!! Thanks for sharing!! What a fun colorful card. Love the color choices. Like the colors you chose and of course,the Ho Ho HO. Merry Christmas! That "HO HO HO" die looks great! So many ideas! Thanks for sharing! Wonderful bright and cheery colors on your card design. Lovely colours on your card, and that die looks great! Another adorable card! Love the snowflakes and the nontraditional Christmas colors. Fun card! I love the color combo....so pretty!! Love the snowflakes on your cute card!